A 10-year-old boy died when he was attacked by a "bulldog-type" dog at a holiday park, police said. 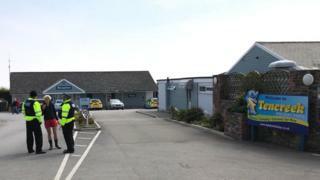 Police were called to a caravan at Tencreek Holiday Park in Looe, Cornwall, just before 05:00 BST to reports the boy was "unresponsive". They said the boy's next of kin were aware and were being supported by police. A woman staying at the site with her two children, who asked to remain anonymous, said she woke up earlier to see police and forensic staff "everywhere". "It is just really eerie," she said. "Loads of people have packed up and left and I have asked to be moved to the furthest part otherwise I was going home." "It doesn't feel like a holiday camp - it is horrible," she added. In a further statement, the holiday park management said the child had been attacked by a dog "present in the same caravan", adding the site would remain open. It added: "Clearly our thoughts are very much with the family involved - they have our deepest sympathies." The mayor of Looe, councillor Armand Toms, said the "tragedy was so sad for the family" and his thoughts were with them. He said: "This community will do whatever it can to help. "It always has done and will in the future and I am speaking not as the town's mayor but as someone born and bred here." Mr Toms said the holiday park had been "part of our community" for about 40 years.